Amazon Price: $112.00 Too low to display (as of January 23, 2019 10:59 pm - Details). Product prices and availability are accurate as of the date/time indicated and are subject to change. Any price and availability information displayed on the Amazon site at the time of purchase will apply to the purchase of this product. 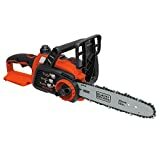 BLACK+DECKER LCS1020 10-inch 20V Max Lithium Ion chainsaw features the 20v Max lithium battery for long run-time and long life- stays charged up to 5x longer! This saw offers a 10" premium Oregon low kickback bar & chain that provides smooth and fast cuts. The tool-free blade tension system allows for improved ease of use and quick adjustments, and it has a lightweight design for ease of maneuverability and reduced fatigue at only 7.2 Pounds. The wrap around bale handle provides increased control and comfort. And, as an added features, this unit has an improved oiling system with a clear window to gauge oil level.